designed for the needs and tastes of professional barbers. 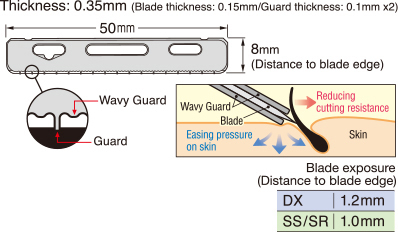 Artist Club razors have two types of handles, "Razor Type (folding type)" and "Japanese Razor Type (non-folding type)" in response to professionals' preference and techniques. both of which have exceptional heat and chemical resistance. Ultimate shaving razor made from the thorough research on shaving feeling of traditional concave razors. Made with stainless steel and is highly resistant to chemicals and rust. ● The body is made of SUS316 stainless steel which is strong against chemicals and rust. ● Handle of ACD-R is made from “Super engineering resin” (resistant up to 135℃). ● Handle of ACD-N is made from elastomer resin (resistant up to 135℃). ● The screw connecting body and handle is anti-slipping design. ● Blade-holding part has a spring-mounted one-touch mechanism, which enables easy dismantlement and reassembly. ● Please use Feather Professional Blades for replacement blades. ● ACD-R and ACD-N can be disinfected by boiling or using ethanol. Do not apply those sterilization to the wooden handle of ACD-RW. ● Do not use sodium hypochlorite for disinfection. ● The body is made of stainless steel which is superior in ductility and corrosion resistance. ● Handles of ACS-RB/RW/RL are made from “Super engineering resin” (resistant up to 135℃). ● Handles of ACS-NB/NW/NL are made from silicone resin (resistant up to 135℃). ● ACS-RB/RW/RL and ACS-NB/NW/NL can be disinfected by boiling or using ethanol. Do not apply those sterilization to the wooden handle of ACS-RSW. ● Do not use autoclave or sodium hypochlorite for disinfection. The long seller standard blade for all kinds of beard. The semicircular guard(patented)offers soft feeling and makes safe and smooth stroke, and long-duration. Recommended for women/sensitive skin, with soft touch to the skin, by less exposure of the blade. Thicker blade recommended for shaving heavy or hard beard stably. 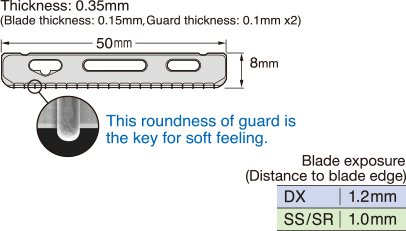 Wavy guards deliver mild feeling. Recommended for women and people with sensitive skin.